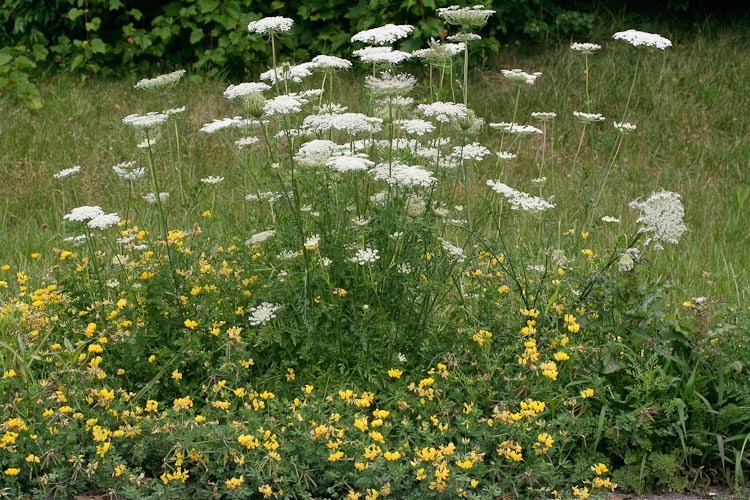 The Apiaceae is a large family of aromatic BIENNIAL or PERENNIAL HERBS. Vegetative charactersthey all share include FURROWED STEMS with HOLLOW internodes, alternate compound leaves with enlarged +/- SHEATHING BASES. Their stems, petioles, and fruits also contain abundant RESIN CANALS, which contain oils that make members of this family valuable in cooking and medicine. There are several food and spices in this family (as well as some of the deadliest poisons). Celery, carrot, and parsnip are vegetables from the Apiaceae, and the “seeds” (actually they are fruits –schizocarps, to be precise) of dill, caraway, fennel, and anise are popular spices. Cilantro (leaves used as a vegetable) and coriander (fruits used as a spice) are both from the same plant (Coriandrum sativum). Anise, used for flavoring cakes, cookies, curries and candy, and candy is one of the oldest known spice plants. Pocket gophers, which are a pest in the west, are are attracted by the smell of anise. Some poison gopher baits are enhanced with anise. (LINK). Anisette is a liqueur flavored with it. Another liqueur, called kummel (the German word for caraway) that is especially popular in traditional British golf clubs, is flavored with caraway “seeds.” Caraway is best known as an ingredient in rye and pumpernickel breads. 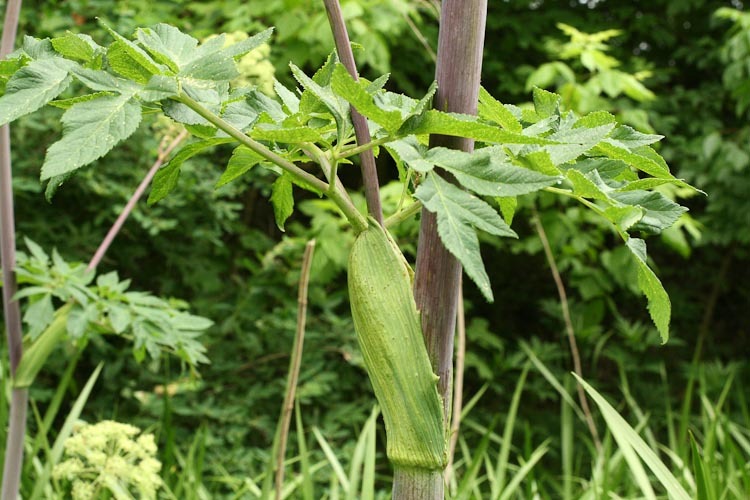 The enlarged sheath at the base of this petiole of a great purple angelica (Angelica atropurpea) leaf is characteristic of this family. The large fleshy ridged stems are also hollow, and the foliage is aromatic when crushed. The small, PERFECT (or occasionally staminate only), ACTINOMORPHIC flowers are comprised of FIVE white, yellow, or greenish petals. If present at all, the sepals are small but distinct. They have EPIGYNOUS perianth attachment, and the ovary below is made up of TWO FUSED 2-LOCULED CARPELS. Apiaceae gynoecium are unique in that the bases of the styles fuse into a structure called a STYLOPODIUM, which rests atop the ovary. The androecium is composed of 5-STAMENS. Umbel within an umbel on Angelica atropurpurea. 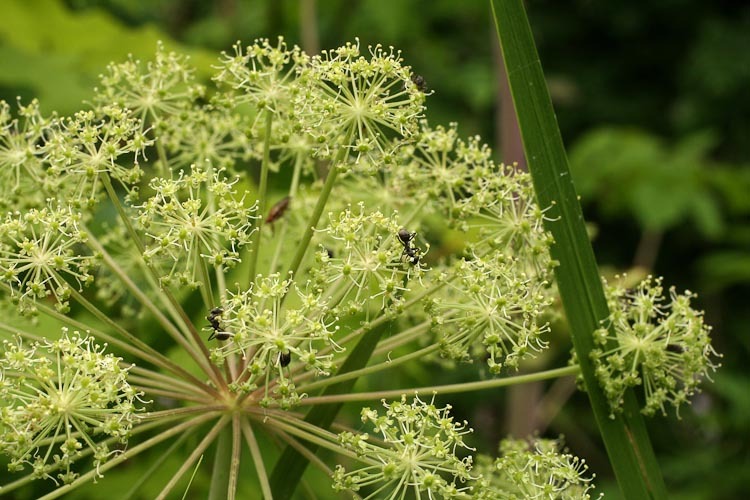 Apiaceae flowers are commonly visited by ants, and other small insects as shown here. Mouse over the photo to see the whole plant. The ripened ovary becomes a SCHIZOCARP (shy-zo-carp), or a dry fruit that, in this unique case, splits into two INDEHISCENT 1-SEEDED MERICARPS (Michigan Flora). As mentioned above, the schizocarp of some Apiaceous plants are commercially prized spices, such as fennel (Foeniculum vulgare), dill (Anethum graveolens), caraway (Carum carvi,), and anise (Myrrhis odorata). Schizocarp of Osmorhiza longistylis. Mouse over image to see what it looked like in flower. 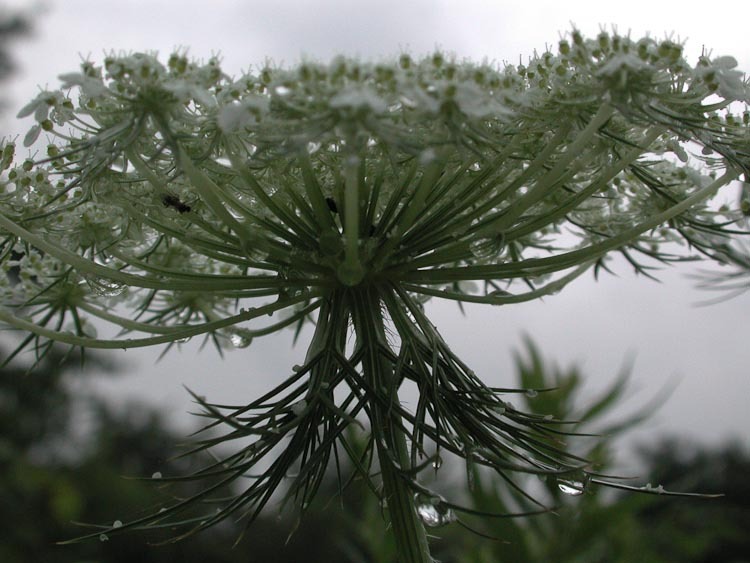 The Apiaceae is one of nine plant families to undergo a dramatic name change from something ending in –ae (i.e. Cruciferae, Labiatae, Graminae) to something ending in –aceae. They were formerly called the Umbelliferae by virtue of their inflorescence type (typically a compound umbel, except in Eryngium and Sanicula). While the name Apiaceae is now more widely used, the International Code of Botanical Nomenclature recognizes both names as being validly published (ICBN, section 18.5). 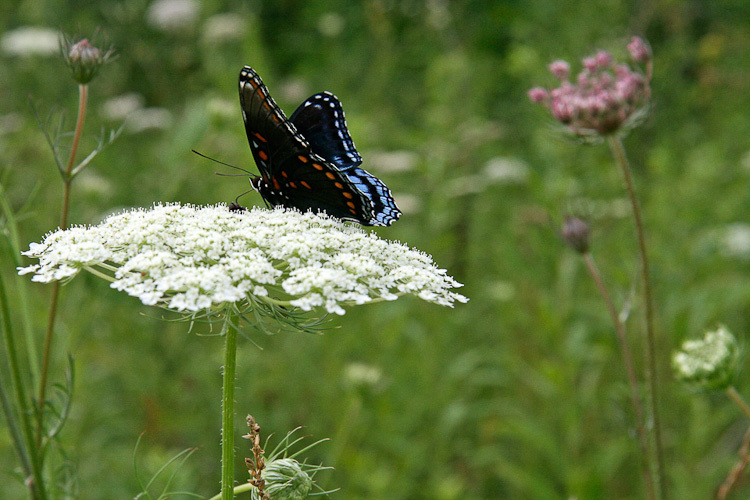 The Apiaceae are a firm reminder that medicine and poison are kissing cousins. 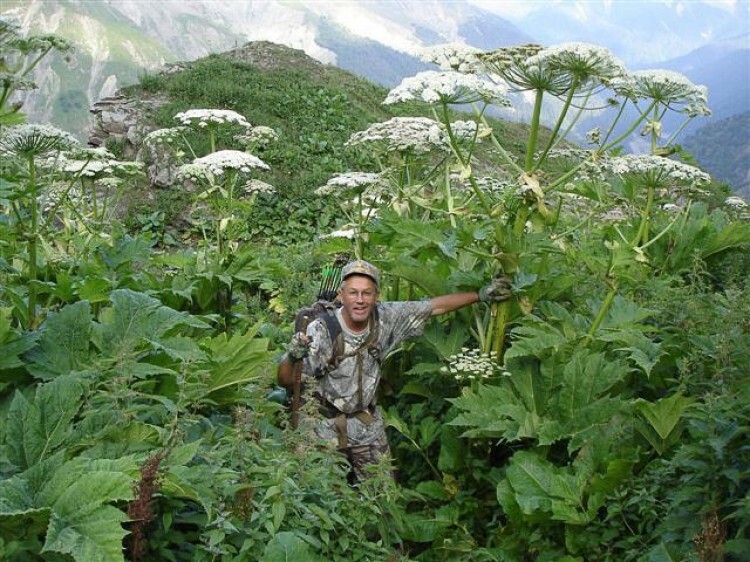 Several members of this family are masters in the art of chemical warfare, including poison hemlock (Conium maculatum, introduced) and water hemlock or cowbane (Cicuta spp., native). 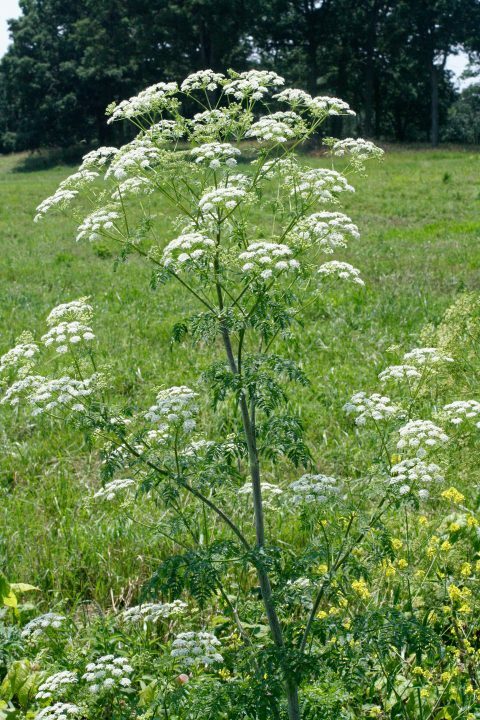 In fact, poison hemlock was used as an agent of capital punishment in ancient Greece (no electric chairs yet). 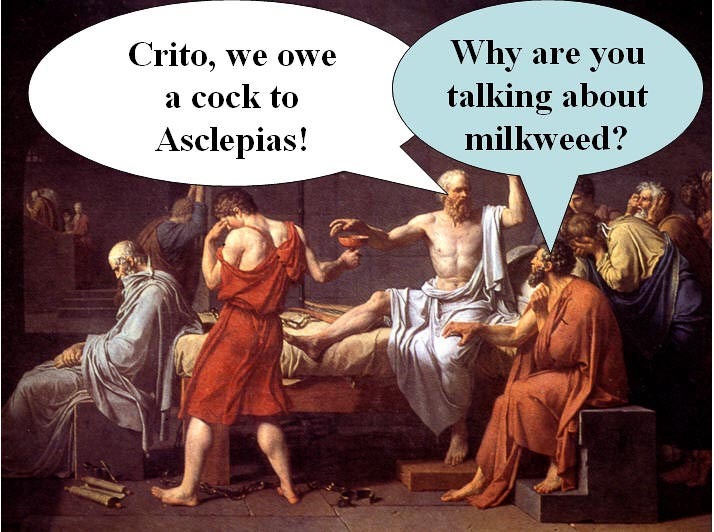 Socrates was condemned by a jury of 501 Athenians to die by drinking an infusion of poison hemlock (Conium maculatum). His crime? Impiety and corrupting the youth with his philosophies. In Local Flora years past, students who did not complete their term projects have been dispensed with in a similar fashion. 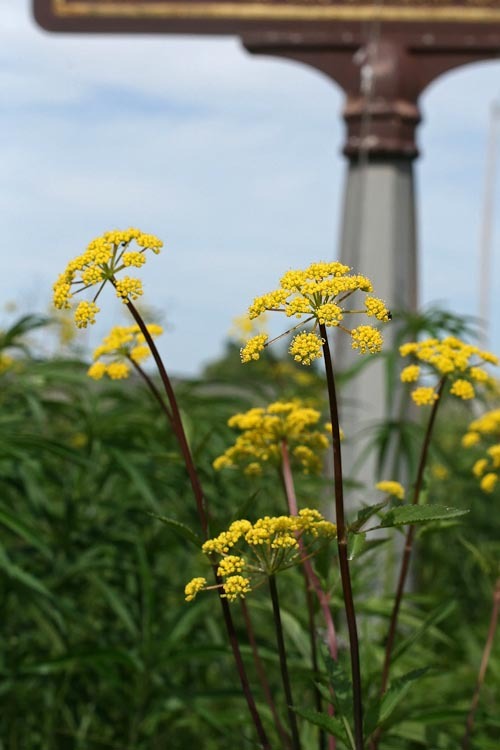 The culprit (which is not really to blame- it has been called many things, but never impious), is a tall, moisture-loving member of the Apiaceae with a distinctly purple spotted stem. 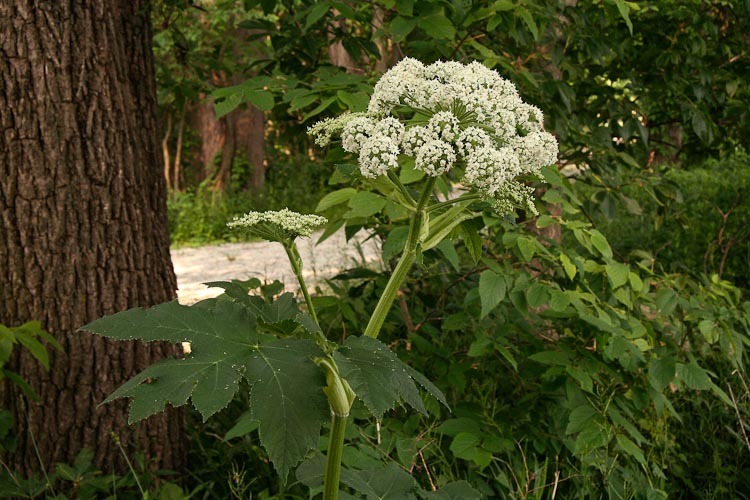 In Ohio it is most commonly confused with Cow Parsnip (Heracleum maximum, native) and Giant Hogweed (Heracleum montegazzium, introduced) in riparian corridors and edges of woods. 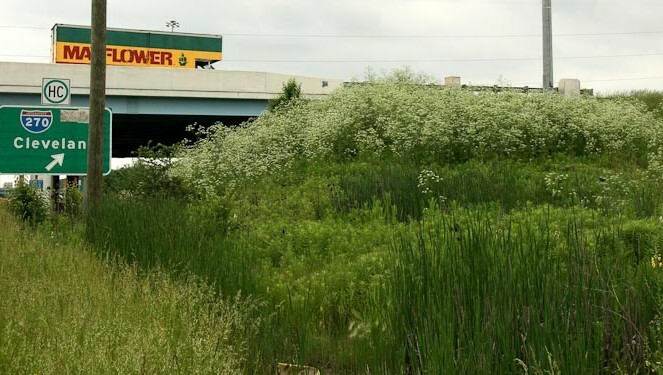 Poison hemlock along a Columbus highway, trying to hitch a ride to Cleveland. 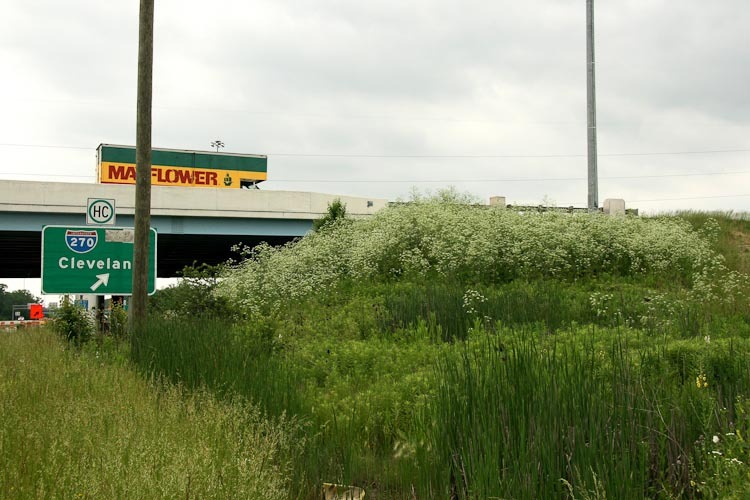 This robust plant readily colonizes disturbed areas along roads and waterways. Mouse over to see a close up. The leaves of poison hemlock are finely divided, and the stem has a whitish bloom on it that rubs off when you run your finger over it. Notice that this native look alike, cow parsnip, lacks the whitish bloom on its solid green stem. What’s wrong with this picture?! I hope this man packed his sunscreen, because this giant hogweed (Heracleum mantegazzianum), while not poisonous, is about to unleash a slew of oils on his skin that react with the sun to cause photodermatitis. Handle with care! All parts of this plant contain oils that cause photodermatitis. 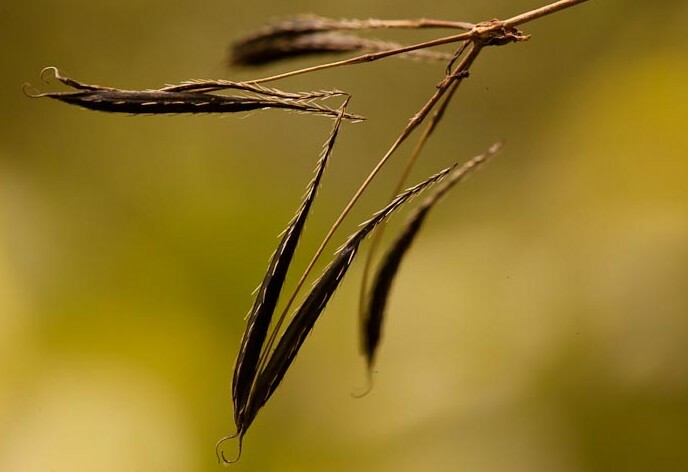 Why doesn’t this plant never shave its “armpit” (axil) hairs? Because it doesn’t have any! 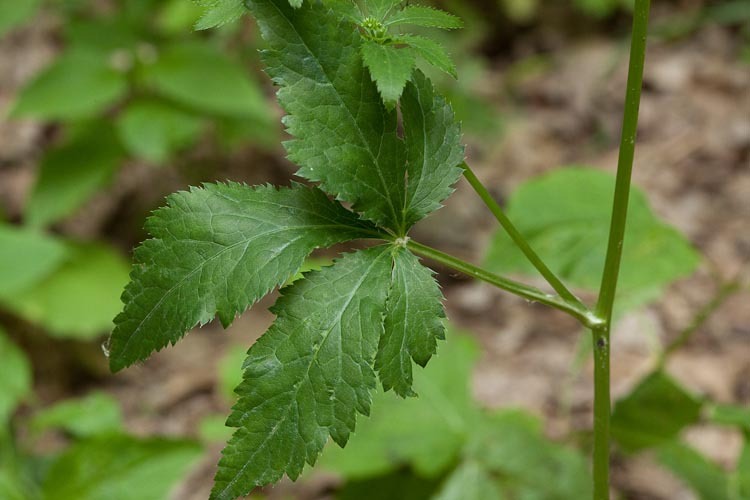 This species looks similar to hairyjoint meadowparsnip (Thaspium barbinode), but lacks the hairy joints. Mouse over to see a close-up of the leaf axil in all its glabrous glory. Usually the first Apiaceae to bloom in spring, this plant is an important resource for early-spring pollinators. Its flowering period overlaps somewhat with another common yellow-flowered species called hairyjoint meadowparsnip (Thaspium barbinode). One quick way to tell the two apart is to look at the inflorescence. In Thaspium all florets are stalked (pedicellate), whereas Zizea has one sessile floret right in the middle of each umbellet. Mouse over to see a dissected umbellet with the sessile central floret. Pictured here growing with Lotus corniculatus (bird’s foot trefoil), wild carrot (aka queen anne’s lace) is a cosmopolitan species that flowers for most of the growing season. “Wild carrot” is no misnomer- this plant is truly the wild progenitor of the domesticated carrot. However, the tap root of the wild type is much smaller an irregularly-shaped than the grocery store varieties. Mouse over to see a close-up of the compound umbel. One theory for the presence of the small purple flower in the middle is that it attracts pollinators by mimicking a fly. Flies are said to be attracted to flowers that already have another fly on them. To tell Daucus from its dangerous relative poison hemlock, look for three major characteristics: 1.) bracts at the base of the umbel, 2.) hairy stem, 3.) small purple flower on the central umbellet. 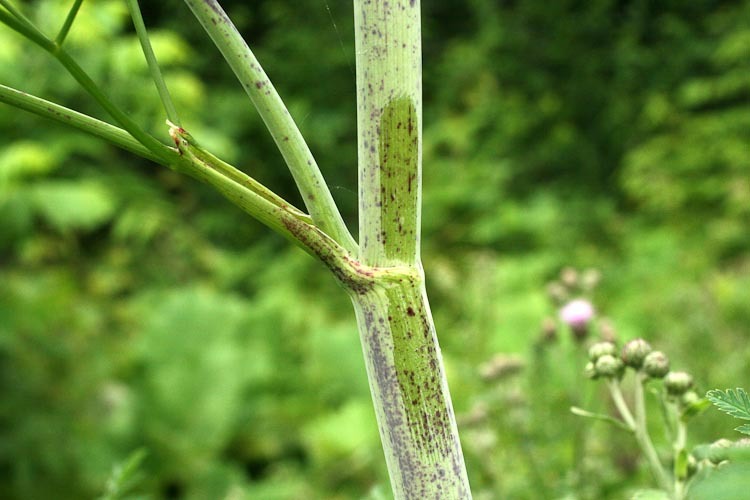 Poison hemlock is a more robust plant, with a smooth, juicy, purple-spotted stem. Late in the summer, these bracts also are home to small cream-colored crab spiders. Picking out these little spiders is especially troublesome for people who make jelly out of queen anne’s lace tea. Although it is not considered poisonous, it is good to remember that wild plants retain chemical defenses that the domestic varieties have come to lack (documented in mangoes, potatoes, carrots, etc.). Therefore this plant is not recommended for consumption by pregnant or breast-feeding women. The genus Sanicula is one of a few among the Apiaceae that lack compound umbels. They are native wildflowers common in forest understories and have inconspicuous, unisexual, greenish-yellow flowers. Staminate flowers are interspersed with the pistillate flowers (above left). Two common species in Ohio are Sanicula gregaria (clustered snakeroot, above left) and Sanicula canadensis (above right). 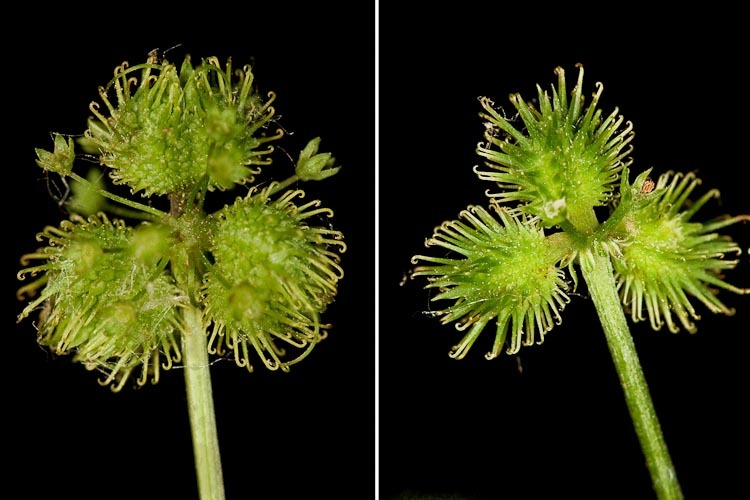 Sanicle leaves are toothed and coarsely divided into 5-7 leaflets (5 in photo above). Flower clusters are pedicellate and arise from leafy bracts. 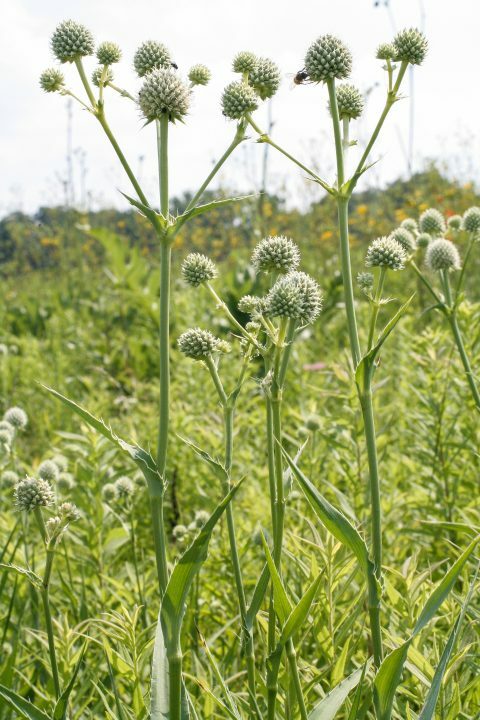 Rattlesnake-master, Erygnium yuccifolium,. is a prairie wildflower. 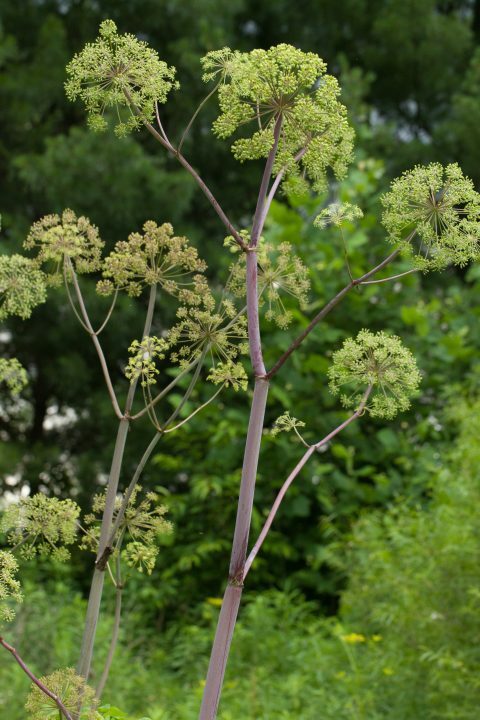 Great Angelica,Angelica atropurpurea, is a huge wetland herb. 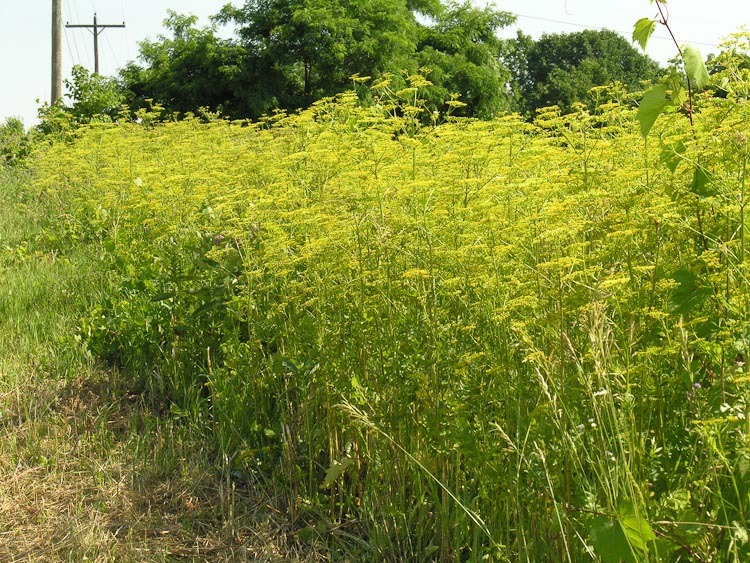 Poison hemlock, Conium maculatum, is an extremely abundant, extremely toxic roadside weed.